In the late 18th and 19th centuries, embellishing one’s coffin with elaborate upholstery and symbolic metal embellishments was very much in vogue, so much so that by the early 19th century coffin furniture had become big business. As a consequence, various pieces of coffin furniture have been unearthed at the Gloucester Cathedral excavations. A coffin grip plate or shield was an elaborate plate with holes through which the coffin handle could be fastened to the coffin’s surface. The grip plates were usually positioned three to a side, satisfying both the physical need to bear the weight of the coffin as well as serving as a visually appealing enhancement. This coffin grip plate is composed of a cast iron handle and tinplate backing. Unlike the backing plate, the cast iron handle- composed of the common design of two winged cherubs- is in fairly good condition, due to the durability and robustness caused by the casting process. 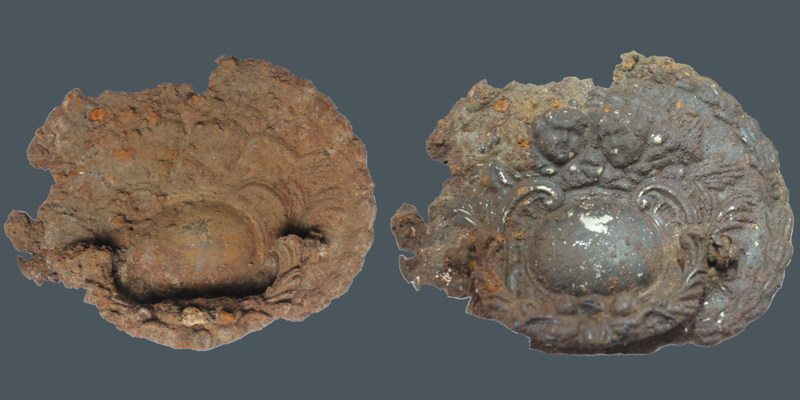 The backing plate, made of pressed tinplate, is also covered in lovely embossed funerary symbolism of two winged cherubs surrounded by laurel and leaves, but has fared less well than the handle and is covered in visible iron corrosion. Tinning is the process of thinly coating sheets of wrought iron with tin, resulting in a shiny metallic surface. In this case, the tin layer was further painted with a black lacquer. Unlike iron, tin is a noble metal and is strongly resistant to corrosion. However, imperfections and micropores within the tin coating allow moisture to reach the iron substrate, causing the proliferation of voluminous rust underneath- a process called galvanic corrosion. This has caused the embrittlement and fragmentation of the tin layer- making it a particularly difficult object to conserve! To give an idea of the images on the grip plate, Ian has been mechanically removing layers of soil and rust with extra fine steel wool and cotton with the aid of a microscope to ease the rust off without scratching the fragile tin surface. As you can imagine, a huge degree of patience and dexterity is required to ensure no further damage is caused, as the plate is only 3 mm thick! White spirit (Stoddard solvent) and WD-40 are used to further weaken any strongly adhered bits of corrosion. Further conservation will highlight the interesting detail on the coffin grip plate and will hopefully shed a new light on the interesting late 18th and 19th century funerary practices of those interred within the grounds of Gloucester Cathedral. We will keep you posted!